Eating in the Shower: A Stone, A Leaf, A Circus Tent? Thomas Wolfe's 1929 novel Look Homeward, Angel begins, "... a stone, a leaf, an unfound door; of a stone, a leaf, a door. And of all the forgotten faces." I've always thought it is one of the greatest first lines. I hadn't read the book until I decided to apply to Cornell in 1999. There were a few choices of essay questions in the application packet. The one I chose was something along the lines of: A stone, a leaf, an unfound door.. What three items describe you? I decided to write my admissions essay in a way that most truly showed who I was. 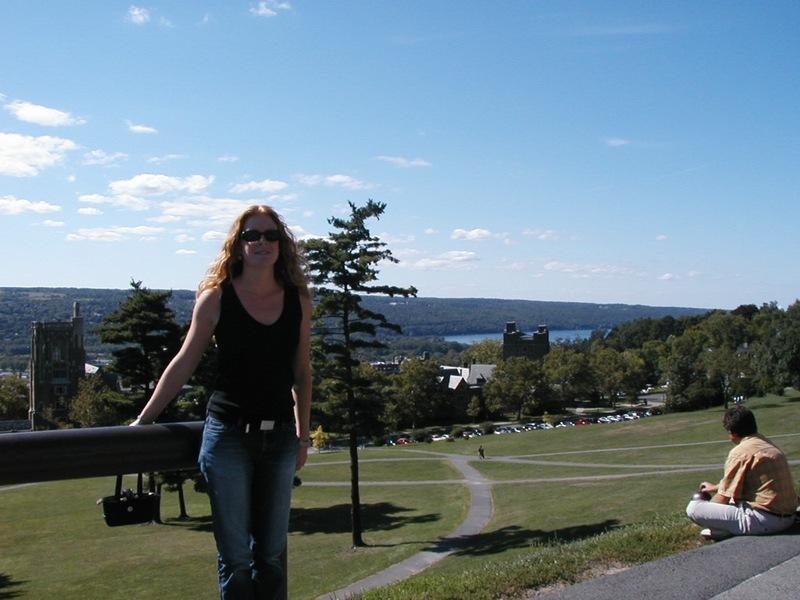 I wasn't a third generation Cornell family member, my family wasn't going to fund a new building on campus, and I was not my class valedictorian- seven years earlier when I graduated from high school. I was a good student, I wanted to learn from professors who wrote the textbook for their class and I wanted to experience life at one of the best schools in the country. The only thing I had to risk other than my application fee was my pride. I wrote my essay in the format "Yesterday I was, Today I am, and Tomorrow I will be." The items that I used were pretty creative and I know that I stood out from the other "forgotten faces" when the admissions committee read my first line. It read simply, "Yesterday, I was a circus tent." I went on to describe how at any given moment you could find a lion, roaring with pride or a tightrope walker, being careful to plan each step carefully, afraid to make the wrong move. I somehow described that I was a microscope today seeing my life and path clearly and in detail and finally, I wrote that tomorrow I would be a landslide with nothing able to change my path. I very accurately described my past and present but of course I was naive about my future and just how many times my path would veer, be redirected, and at times even seem to be halted! To this day I believe that my essay played a large part in my admission to Cornell. Surely, many other applicants had grades as high as mine, SAT or other scores to beat mine, or more to pad their resumes. I am certain that not a single other student used a circus tent to describe who they were. If they did I need to meet them. I'm so glad that I was honest about the real me at the risk of being rejected or even laughed at. My decision to write in my own way and not how I thought the Ivy League might want to hear me paid off in the best way. After being accepted, I visited the campus to meet in person with an admissions counselor in my specific school. She talked to me as if she had objected to my admission! It was a lot of, "People that come here from small towns tend to get overwhelmed," and "If I had accepted you I would have required another math before entry." I drove four hours home that April day wondering why there had been no congratulations, no advice for best classes, no secret handshake. I was packing up my life and moving there in a few months and now I felt like it had been some sort of mistake. 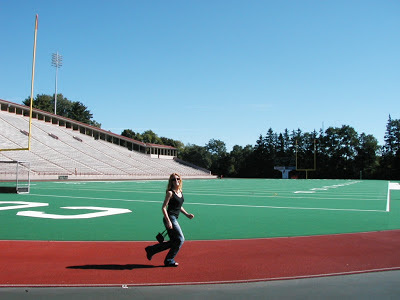 My first experience at Cornell was one of the counselors basically telling me that there was no way I was going to make it there. I swear, every semester that I made the Dean's List I wanted to email her and I just may have stuck my tongue out at her as I processed past her in my cap and gown on the way to my graduation in the stadium two years later. That is an amazing risk - and it totally paid off for you! Sometimes the hardest thing about writing those types of essays is KNOWING that you have to somehow stand out from the sea of essays the admissions team has to sift to. I know I would be so caught up in trying to figure out how to point out the things that make me worthy, that I would have procrastinated for weeks!! I'm going to keep that "what I was, what I am, what I'll become" analogy in the back of my mind for the next time I need to write an article like that. So inspiring! Thank you! You are right on about the time I spent "prepping" to write the essay. What a delicious thing to read first thing in the morning! You are a tremendous writer. I love this so much. Thank you for sharing this story. I am truly inspired. I am 46 this month, and still on pins and needles waiting for my acceptance letter to University of Southern Oregon in Ashland. When I went down to turn in my transcript from high school a month ago, I was so excited, I somehow ended up driving my mommy SUV across campus on a walking path. Don't know how I got on to it, but I had to meander around, being pointed back to real roads by a variety of students. When I got to the admissions office and got the opportunity to talk to a counselor, I broke down in tears. This has been a really long time coming. He was very sweet. He said he wished all his students were as ridiculously happy at the thought of coming to school as I was. Here's hoping I get that letter! Thank you so much for reading and sharing. I can't tell you how much it means to have someone say that my story inspired them! I hope you get the news you are waiting for very soon. How fantastic!! I love how very creative you were with your essay. I have a fifteen-year-old daughter who insists she won't get into a "cool" school like her sister (who is attending Smith College in Northampton, Massachusetts - which is a far cry from Bakersfield, California.) She laments her GPA is too low and she isn't organized enough. I counter my GPA was lower than hers and with her writing skills, I am sure she can write one of the world's greatest essays for admission ANYWHERE. She says "White girls are a dime a dozen" and I say, "I believe in you!" I need to show her this blog post. You are an inspiration! Happy NaBloPoMo! Oh thank you so much! If only it were possible to share with our 15 year old selves what we now know. Why does confidence and self awareness take so much 'living' in order to come around?